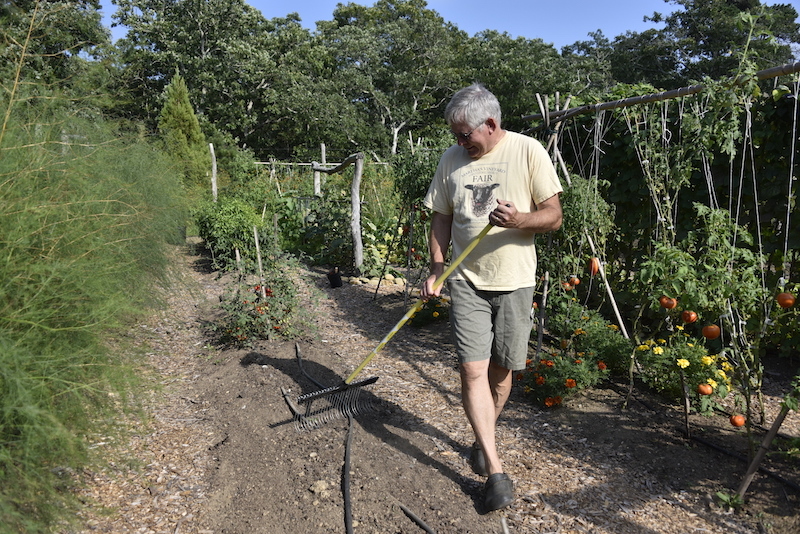 Be forewarned: If you are retired, or are about to retire, or think you’d like to retire someday (okay, that’s everyone) and you’ve always dreamed of a big vegetable garden (maybe not for everyone), prepare to become obsessed. 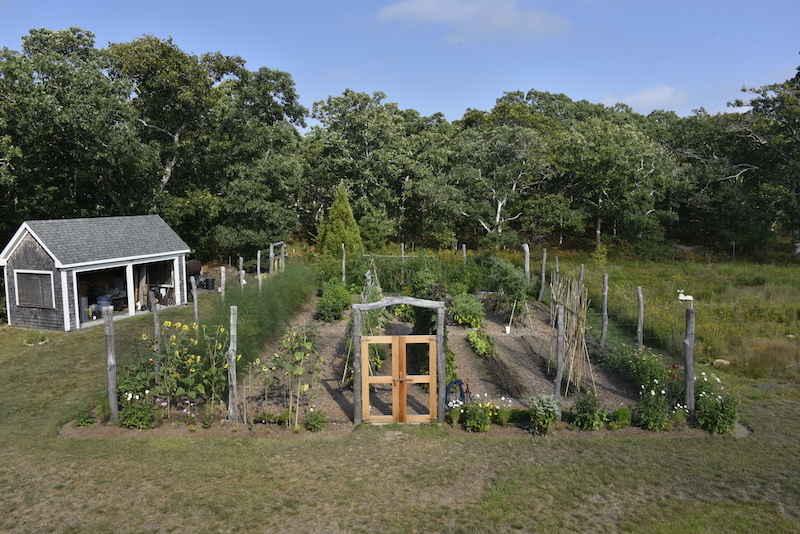 That is, if you’re anything like David Fielder, who found himself drawn into vegetable gardening when he and his wife Libby retired full-time to the Vineyard in 2010 and built a house in West Tisbury. They started out with a small enclosure, ringed by plastic fencing left over from building their house on a cleared piece of land not far from the state forest. But they soon realized they wanted to get serious and by 2013, David was hard at work on creating a fenced 40’ by 60’ garden. Retiring on the Island was inevitable for David and Libby. David’s grandmother was poet Dionis Coffin Riggs and as a child, David and his four siblings spent summers with her on the Vineyard, even while living abroad – many years in Turkey – during the rest of the year. Two siblings now live full-time on the Island. But childhood summers were mostly spent messing around in boats on Tisbury Great Pond – not gardening. That is probably the first lesson a prospective gardener of a large vegetable plot would take away from David – a sense of commitment. “There’s a season in life for doing this kind of garden; we’re blessed with enough discretionary time to tackle a big project like this,” he comments. Having the time and the will to see it through is important; it also helps to be open to failure. 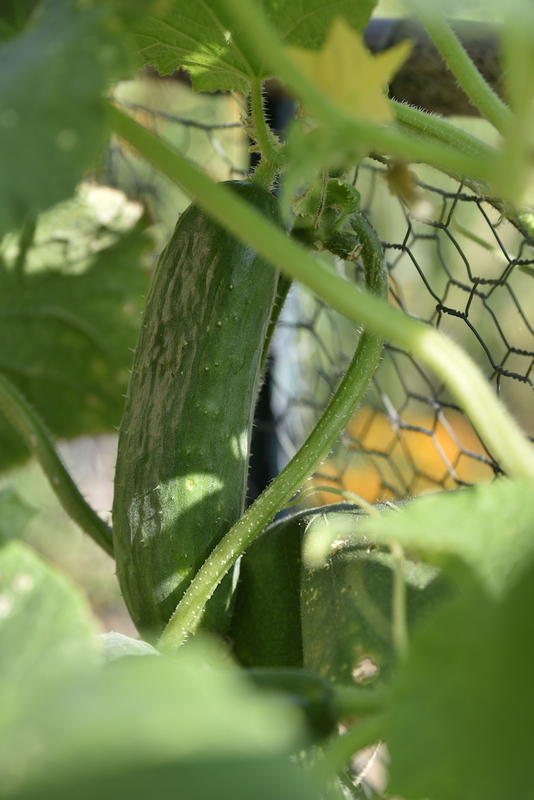 But if you’re a natural problem solver and you like a challenge, vegetable gardening on this scale is not only physically and intellectually stimulating, but also “good for your soul,” as David says. If you think a big vegetable garden might be in your future, David and Libby’s garden offers tips and inspiration for some of the key factors to consider when planning, including location, water, infrastructure (fencing especially), soil health, and – something people often forget about – what you’ll do with all that produce you grow. Finding a sunny location for a small vegetable garden can be tricky; finding a spot for a 40’ x 60’ garden – one where the sun will be able to reach most parts of the garden for six or eight hours a day – is nearly impossible without a lot of forethought and some patience. David and Libby planned for open space when they built their house; the geo-thermal heating system they installed runs horizontally out from the house, allowing them to nurture a meadow of native plants over it where scrub oaks once were. The meadow is just far enough away from the house (and the shade it creates when the sun sets) to allow a good spot for both the vegetable garden and a berry patch behind it (to the east), which in turn is still somewhat removed from the tree line on the eastern edge of the meadow. There is a bit of morning shade while the sun rises over the tree line. If you have a wooded lot, you can do some clearing, but it may take a few years to get it all done and the ground ready for planting. If you have your heart set on maintaining a big vegetable garden but you don’t have the land, there are more and more opportunities now to lease a vegetable plot; contact Island Grown Initiative’s Farm Hub, the land bank, or your town. Or you might consider working with a neighbor who does have land or initiating a community garden in a neighborhood space. There’s no sense in putting the effort into a large vegetable garden if you’re going to leave it exposed to deer. And deer are simply everywhere on the Island; there’s no escaping them. They will jump over a stone wall, a wooden fence, or other low structures (unless the enclosed space is very small—they don’t like to feel trapped), so it’s best to erect a deer fence that’s at least 8 feet tall. David, who volunteers at Polly Hill Arboretum, modeled his fencing (and a pair of beautiful new gates) after Polly Hill’s playpen — the place where young plants are nurtured. He found PVC-coated hex-wire and tension wire online at a deer-proofing website. The coated hex wire is attractive because it virtually disappears when you look at it from a distance. Adding a row or two of tension wire across the top of the fence adds another couple feet of deer-discouraging height, which is helpful because you’ll want to bury the bottom of your hex wire about a foot as David did. By curving or bending the wire in a shallow trench, you create a barrier that prevents burrowing critters from coming through under the fence. Spending the money and time to get the fencing secure in the first place is truly worth it; it will last for years. David was able to harvest locust trees from his mother’s property to use as posts, placed about 10 feet apart around the garden. Locust posts are common in Vineyard gardens, but it is no small bit of work to procure them and dig the holes for them. Mitchell Posin of Allen Farm is a good source for other types of fence posts and Island landscapers can install garden fencing as well. 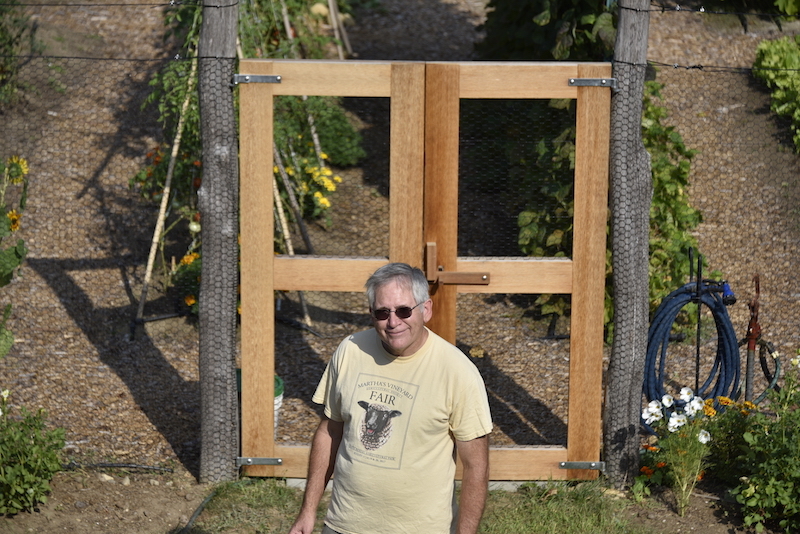 David’s brother Evan, a skilled carpenter, helped design and build the cedar and mahogany gates (also modeled after Polly Hill’s playpen), added this spring. One other thing that David and Libby thought of during construction and the subsequent evolution of their meadow and yard was a water source that would be convenient for a vegetable garden. In their case, what is essentially a standpipe that runs vertically down below the frost line to a reservoir of well water. The pressure from the hydrant is strong enough to supply water to every bed in the vegetable garden for several hours straight. Having a water source near the garden sure beats hauling a chain of hoses out from the house every time you have to water (because of course the hoses have to be disconnected for lawn mowing). In general, getting adequate water to a garden can be one of the most challenging and frustrating things about growing vegetables. At the very least, plan for a spot near the main entrance to the garden where hose connections can be centrally located. Inside the garden, David was diligent about installing adequate irrigation for every bed (a 3-foot-wide bed needs at least two drip hoses), and he designed the system so that he could shut off any row he didn’t want watered. 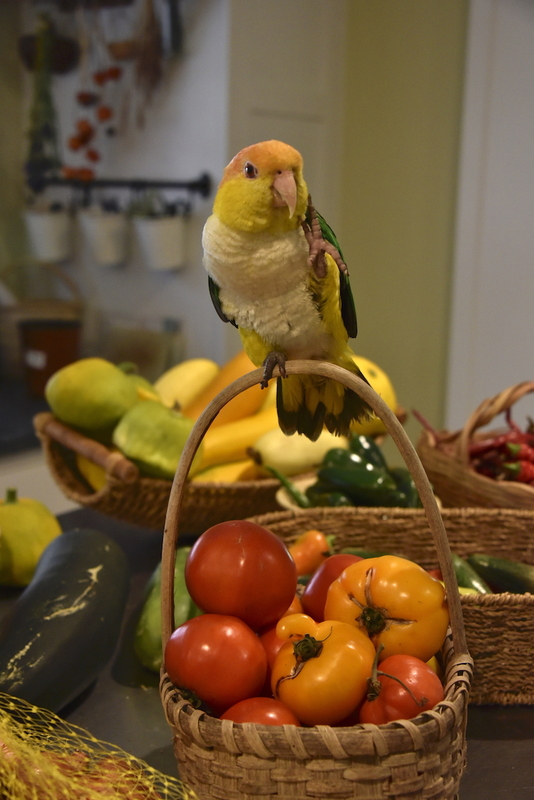 For the most part, he’s happy with his drip hoses and his system, but if he were to upgrade, he feels like he would go with a more critter-proof material and a system from the company Drip Works, which Polly Hill also uses. 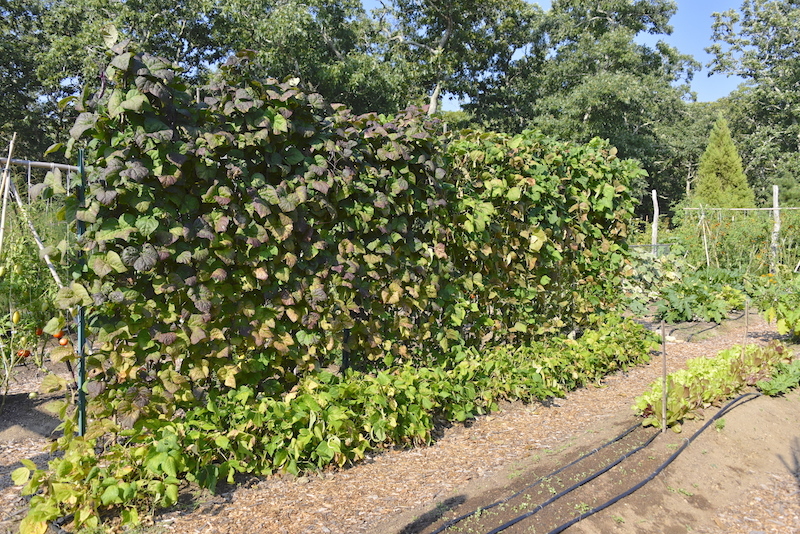 It’s worth noting that straight, uninterrupted rows are easiest for installing drip irrigation, with each drip hose connecting perpendicularly to a horizontal main line. Good to think about when designing your initial garden plan. A big vegetable garden is not necessarily the place for curved or irregularly shaped beds. “That whole soil improvement process…it’s just so important,” David notes. 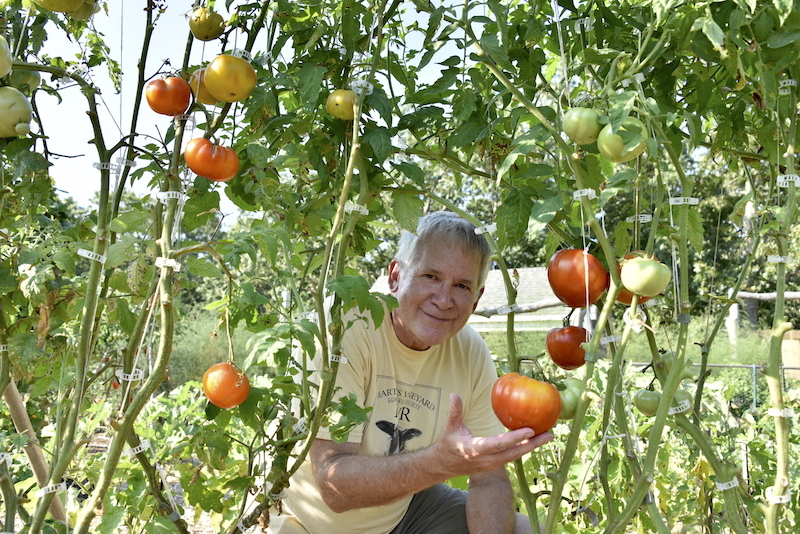 He remembers that long-time Island vegetable gardener (and multi-blue-ribbon winner) Paul Jackson said improving his soil over decades was the key to his prize-winning vegetables. “Aggressive composting is really important,” David says. The Fielders compost everything from the garden and from the kitchen that they can. But the key ingredient is green manure from a local horse farm. “The green manure heats up and allows the compost pile to get to 140 degrees, killing any weed seeds,” David says. This year David added a generous amount of compost to the holes he dug for his tomatoes. And those holes were a full 18-inches deep; David used his post-hole digger! The deep holes were ideal for burying the tall tomato plants half way up their stems, allowing the plants to send out a lot of roots. The plants had gotten extra tall waiting for the warm planting weather, because the Fielders enthusiastically started their seedlings a bit too early this year. David also added Tomato-Tone, an organic fertilizer specifically for tomatoes, to the planting mix. Learning to use the right fertilizer — as well as what particular nutrients each vegetable likes — is part of the soil equation, too. It’s an endless learning curve, David admits. A good supply of compost also allows David to use it generously not only in his planting mix but over the top of beds. 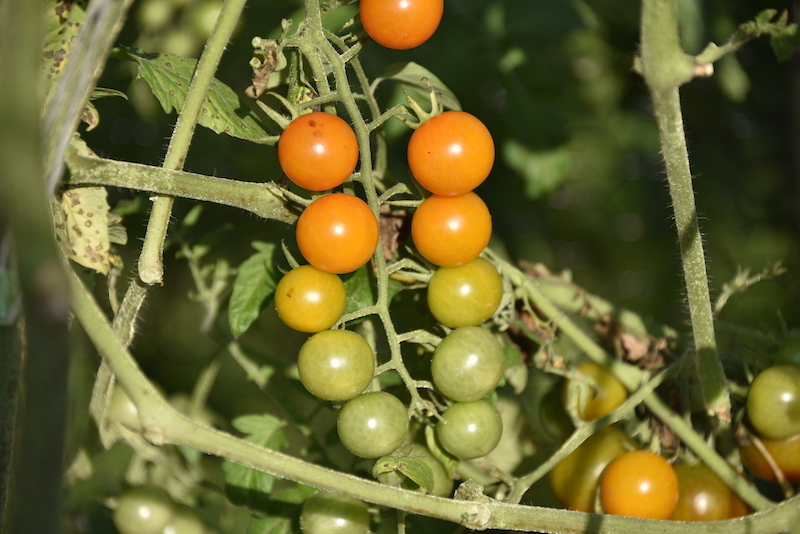 This year, he layered compost over the soil in his tomato beds in an effort to prevent the spread of blight, which tends to be carried in garden soil and splashes up on tomato leaves during rain. David is also rigorous about pruning his tomato plants to stay ahead of the blight. 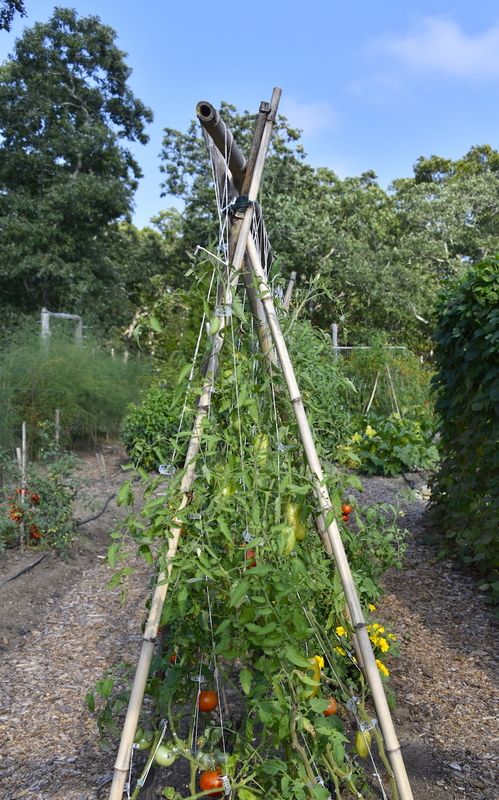 David has devised various structures in the garden for supporting beans and peas with bamboo harvested from his mother’s yard. 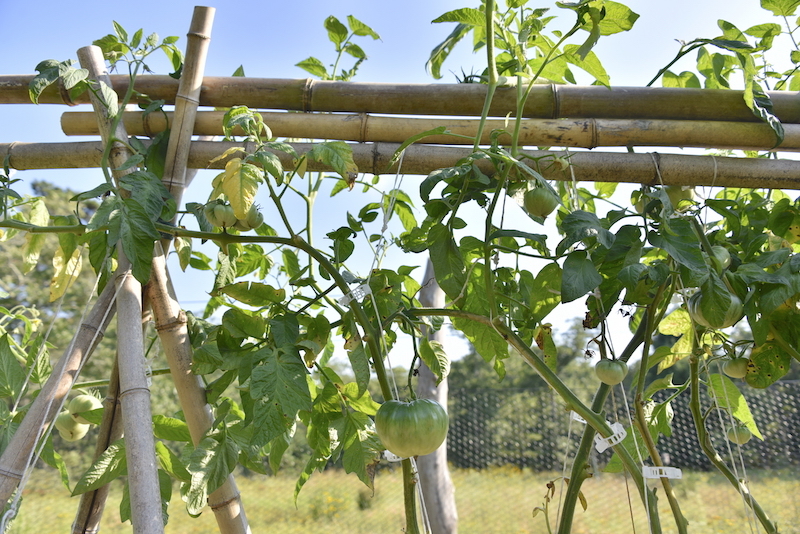 But probably the most elegant structures are the bamboo and twine tomato trellises — an idea he got from a Martha Stewart video. 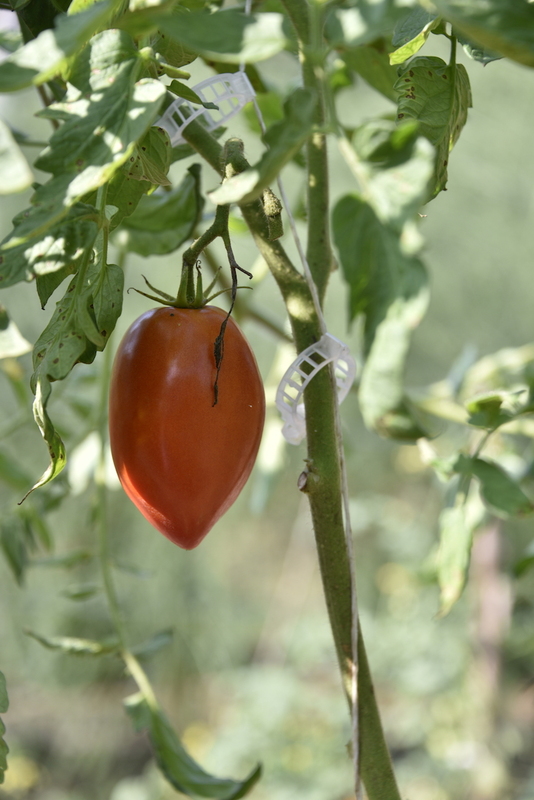 As the tomato vines grow, they are clipped onto the twine using plastic tomato clips, which can be bought in bulk from garden supply sources. You will begin to feel like Lucille Ball in the chocolate candy factory if you don’t have a destination for the huge yields that come out of a big vegetable garden over a short period of time. David and his mother feverishly make pickles and hot sauce; Libby roasts and freezes tomatoes. They make tomato sauce as well. 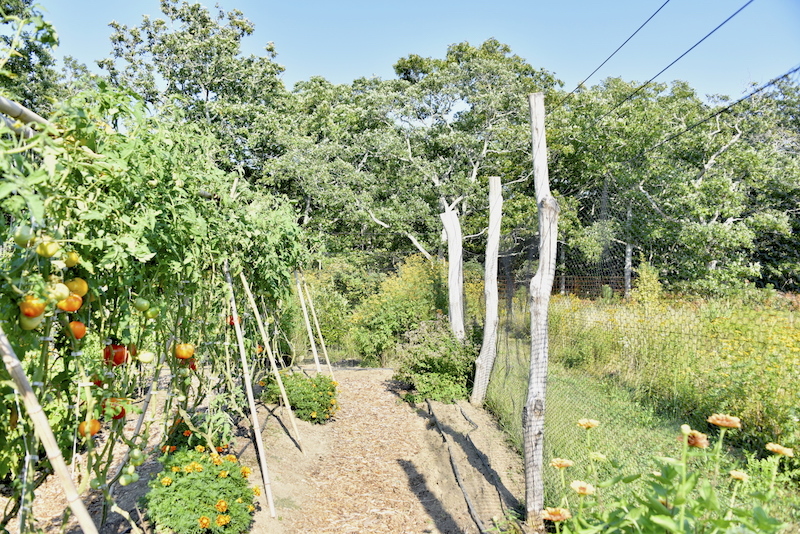 The Fielders also have the opportunity to share veggies with fellow church members at the First Congregational Church of West Tisbury, where they are very active. David is a deacon and the financial secretary; Libby is one of the Sunday School directors. The Fielders hold church gatherings and parties at their house for special occasions like the recent tenth anniversary of Rev. Cathlin Baker’s arrival. David and Libby originally thought the garden would be feeding their son and daughter-in-law as well, but the pair has recently moved over to grandmother Ann’s house. With such a large garden for only two people, David has talked with a neighbor about possibly evolving the garden into a more communal space. In the meantime, the garden guarantees a thoroughly engaging and physically invigorating activity in retirement — and the opportunity to share both vegetables and tradition with friends and family.